One of the pains of being a car historian is a lot of shoulda, woulda, coulda comes along with the job. 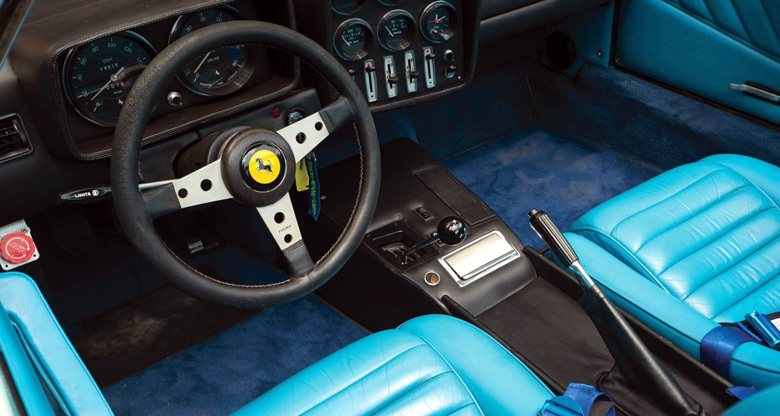 Take this red, white and blue Targa-topped Ferrari Daytona for example. In 1978, painted red with no hint of its competition DNA, this Ferrari sat on a used car lot in West Los Angeles. A genuine, built-in-Modena, 1972 Ferrari 365GTB/4, the car had a different body shape. I recognized it as the white Ferrari with blue and red trim I’d seen at Bruno Borri’s Ferrari shop on La Brea Avenue in Hollywood a few years earlier. While the side and back shapes looked genuine, the rest of the car resembled a ‘68 Corvette body style. Who would want to drive a Ferrari that could be mistaken for a ‘Vette? The car had initially been scheduled to race in the 1975 24 Hours of Le Mans. 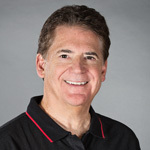 And theoretically, it should have since the team entering the car was lead by Ferrari legend Luigi Chinetti, founder of the North American Racing Team (NART). Something about this car does strange things in the mind. Like someone in California customized their Vette to look like a Ferrari. 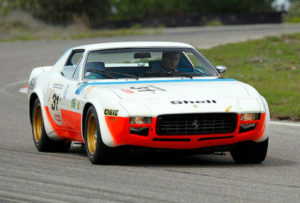 Chinetti had requested ex-Pininfarina designer, Giovanni Michelotti, to re-body the Ferrari 365 GTB/4 Spider for NART. 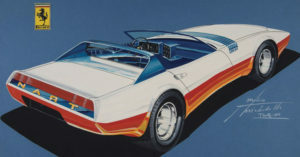 In 1974 Michelotti fitted the 1972 s/n 15965 with a new body, a Targa style top with cut down doors, molded bumpers, and faired in open headlamps. Chinetti planned to enter s/n 15965 in Le Mans, as a kind of return-of-the-champion appearance, to celebrate his victory ten years earlier when his 250LM took first place (much to the surprise of everyone in attendance). What made chassis 15965 unusual is that it was still a street car, but had all the equipment for racing—roll bar, the whole nine yards. The engine from the Group IV Daytona s/n 15685 already had high-lift camshafts, racing headers, and a higher compression ratio, and came with side-mounted exhausts. Chinetti and crew arrived at the 1975 Le Mans 24 Hours race with three other cars in addition to the Michelotti 365 GTB/4: a standard Group IV Daytona, a highly modified 308 GT4, and a 365 GT/4 BB. Running in the GTX class, the Michelotti 365 GTB/4 qualified with a lap time of 4:31:08 with Jean Pierre Malcher and co-driver Patrick Langlois sharing the driving. The Ferrari logo on the steering wheel also looks incongruous. That’s not to say the car isn’t neat. Just different. It’s been said that in life there are no second chances, but in the case of s/n 15965, there was–the 24 Hours of Daytona. After being entered and accepted, the Ferrari had a good practice lap time beating most of the other cars qualifying times. And then it happened again. A rival racer, Peter Gregg, complained that the car didn’t have a mass produced body like the other Ferrari Daytona’s. The car’s American racing debut was canceled. Gregg smugly went on to win the race in his Porsche. A Texas oil millionaire, with a sharp eye for unusual cars, bought s/n 15965 next. He had the car reconditioned for the road and drove it occasionally over the next 12 years. 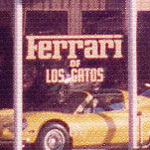 In 1987, famous car collector Patrick S. Ryan purchased the car and started showing it in events like the Ferrari Club of America national meet, Lake Lanier, Georgia. And who should be there but Luigi Chinetti himself, as that convention was highlighting NART, his old racing team. In 2002, s/n 15965 returned to racecar specs. When Dyno tested it delivered 420 bhp at 6,400 rpm in road configuration and 450 bhp at 8,100 rpm when set up for racing. At the very minimum, the Ferrari pumped out 70 bhp more than a standard-specification 365 GTB/4 Daytona, making a monumental difference in performance. 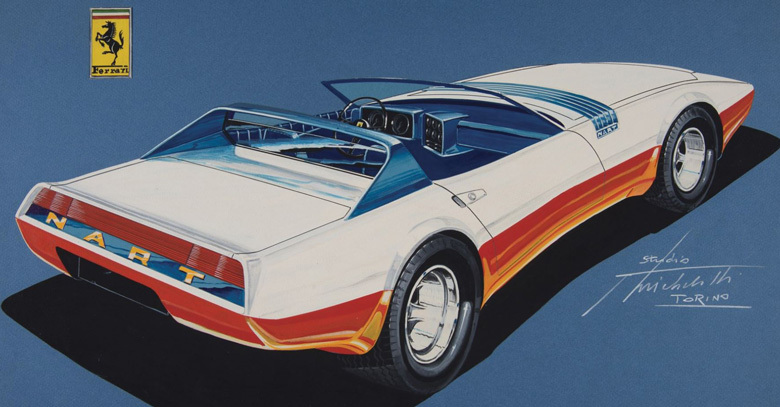 Perhaps the Michelotti vision as depicted here was not translated into metal as well as his other works…. The car had been driven only 14,000 miles over 50 years and was marketed to sell for $2,300,000 or more by RM Sotheby’s. When the 2018 auction took place in Monterey, California, bidding reached $1,700,000, but the Ferrari never made the official list of sold cars. The fact that the last owner resides in France presents a wee problem as any buyer in the United States would have to pay customs duty—not fair, I say, because the car was imported to America decades before and duties were already paid. How many times do you have to pay duty on the same damn car? I’ve quenched any errant tears when it came to how I missed a Competizione Daytona because I thought it looked too much like a Corvette. I didn’t realize how truly rare it was…. 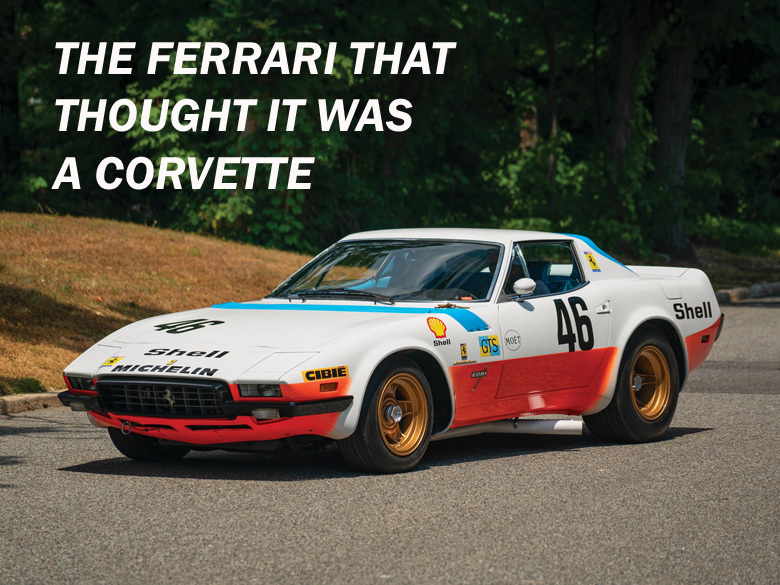 Thank you to author Wallace Wyss for allowing us to reprint The Ferrari that Thought It was a Corvette story that originally appeared in VeloceToday.com. If you have comments or a story about a Ferrari, or any other classic car story, please share it with us here. Be sure to attach photos as well.